In any human life there are moments when it is possible to feel overshadowed or overwhelmed and at a loss as to the right course to take. The obstacles that confront us may appear to us insurmountable and the challenges we face so daunting as to be beyond our powers. People can be so conscious of their own weaknesses that they become paralysed with fear. Or perhaps much of their existence is already dogged by fear, in any case. Confusion and fear are mind states common to all human beings and present throughout the animal realm. Even the Bodhisattva, the Buddha-to-be, by his own admission, experienced fear and dread. As we deepen our meditation practice and as we come to better understand the Dhamma, so such states of mind can be properly known, related to and understood. It is our reluctance to know them for what they really are which enhances their power. Through this practice we can start to cultivate deeper compassion both for ourselves and for others. In addition we can cultivate the wisdom necessary to see that such states of mind are not our true self but that they come and go according to conditions. Once we see things clearly with Right Understanding, we can naturally feel more at ease and are better able to cope in a world of constant change. This weekend retreat is suitable for both beginners and experienced practitioners. Please note: it is not possible to register only for 1 day of this retreat. We kindly ask you to attend both days. When people drop out this negatively affects the dynamics of the group, the feeling of continuity and progress. This retreat is offered on a donation basis as the teachings of the Buddha in the Theravadan tradition are available for free. In order to make a secure booking, please complete the online booking form. Dana for the teacher. It is Theravadan Buddhist practice that monks and nuns don’t touch/use money. 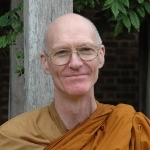 Any donation that we get for teaching will be transferred to the English Sangha Trust. Dana to Irish Sangha Trust (IST). Any donation made to the IST will be used to cover the cost of the retreat. The organizers of IST are volunteers and do not financially benefit from the IST funds. Venerable Ajahn Dhammanando grew up in Carshalton, Surrey, a fairly typical suburb of South London. He attended Mitcham Grammar school and went on to study English and History at Keele University in Staffordshire at a time when the curriculum there was broad and multi-disciplinary. He was aware of certain deep questions, barely articulated, on the inside, however he did not pursue a spiritual quest to find answers as the religions which he encountered in the UK appeared to him only marginally relevant. It was after graduation on going to Thailand as a volunteer teacher for VSO that he found some initial signposts, although at that time he had almost no understanding of Buddhism. In 1985 he took a year off work in order to spend time as an Anag?rika in Amaravati and Chithurst monasteries. Four and a half years ensued during which he studied for an MA at Essex University, among other things. The realisation gradually dawned that Going Forth was what he really needed to do and that his more worldly interests were of lesser importance. In 1991 he returned to Amaravati to re-ordain as an Anag?rika. In July 1993 he took Upasampada with Luang Por Sumedho at Chithurst and trained initially with Ajahn Sucitto as his Acariya. Between 1997 and 2004 he went on to train in Switzerland, then Italy, followed by a return to Amaravati and then to Chithurst again before going overseas to Australia and New Zealand, spending time in different monasteries in Australia before living two years at Bodhinyanarama in Wellington. He returned to the UK in May 2007 to be nearer his parents and, ever since then, he has been resident at Amaravati but has also made occasional trips abroad to teach in France, Slovenia and Hungary. Currently he makes regular teaching visits to a local prison in Bovingdon and assists in receiving school groups at the monastery.